A YouTube video shot inside the One Infinite Loop Apple headquarters Caffe Macs restaurant depicts the iPhone X "in the wild," being used to pay for a meal with Apple Pay, as well as other basic uses. 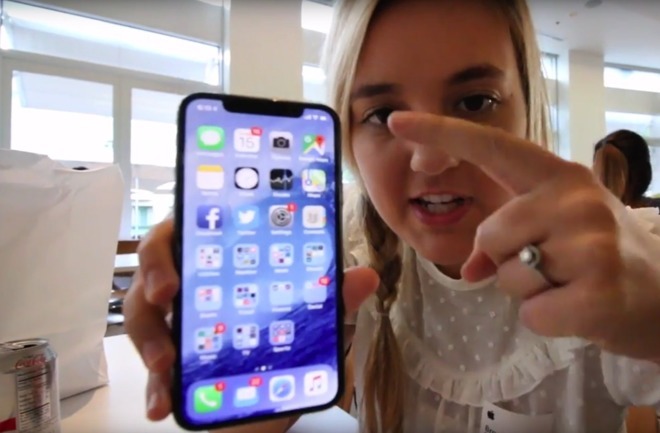 The original video by Brooke Amelia Peterson started with a shopping montage, with footage of Apple's pre-Apple Park campus beginning at around 2:25 in the video. The video then shows Amelia's father using Apple Pay on the iPhone X very rapidly, and then has the woman using the phone in the restaurant. Practical use of the iPhone X begins at about 2:50. The iPhone video shows notifications, the control center getting pulled down, and the Animoji feature in-action. The video host's father also notes that his team is moving into Apple Park in December. Update: The video has been removed from YouTube. It remains on Reddit.